Hot on the heels of his tour de force from 2017, Dunkirk, Christopher Nolan's previous film has also arrived on 4K disc now and it's well worth your time and/or money. Nolan, who before Dunkirk was probably most famous for his excellent "Dark Knight" trilogy (also available in 4K), really pulled out all the stops when he followed up "The Dark Knight Rises." "Interstellar" is a science fiction tale of hope for the future of Mankind (oops, Personkind, for all you in the ranks of the perpetually offended) that begins on a dying earth that's threatening to starve its billions of residents and ends up with a re-energized human (or huperson, if you will) race reaching for the stars. It's quite the journey and Nolan takes 169 minutes to tell it, which is a tad long but never made my bum squirm in my seat from boredom. In fact, while I doubt Interstellar will be one of my "desert island discs" (unlike Dunkirk), it's a movie to which I return periodically for its great "serious science fiction" story and its attention to detail. And now, with the 4K disc release, Interstellar soars even higher. It's a great home theatre treat! 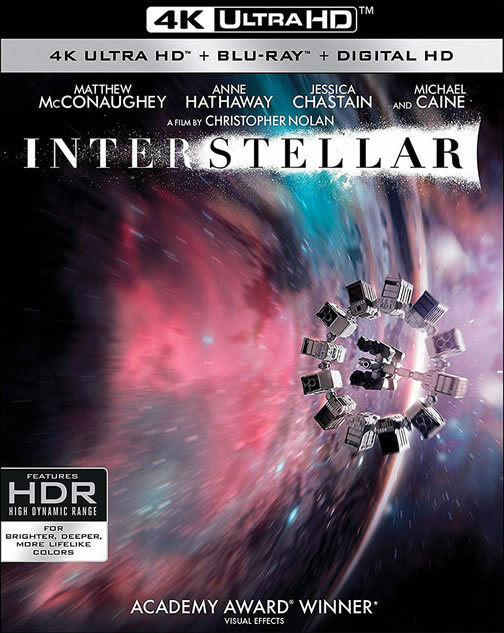 As I said when I reviewed the Interstellar Blu-ray when it came out, the film "blends some 2001: a space odyssey with a tad of 2010, a bit of The Black Hole, Contact, Queen's song "39", Heinlein's novel "Time for the Stars," and a smattering of few other sci-fi stories good, bad and indifferent. The result is an epic film that offers a compelling yarn and looks and sounds gorgeous at the same time. It's a very big movie that deserves to be seen on as big a screen as you can muster." I reviewed that version on a 106 inch projection screen, but for this 4K release I was limited to the 55 inches of the Panasonic 4K TV I've been using. I look forward to trying it again when true 4K projectors become affordable and it'll be one of the first titles I try on that happy day, but in the meantime, 55 inches is no slouch in an appropriately-sized room and I'm lucky enough to have such. As is also typical of Nolan's films, at least his latest few, the disc features an audio soundtrack that's so loud and dynamic I had to turn my Rotel system down about 10 notches from my usual volume lest the "point one" channel cause my house to slide down the incline on which it's built and land on the street below, much to the chagrin of my neighbours. Interstellar follows Cooper (Matthew McConaughey), former pilot and engineer who now plies the farming trade, growing corn on an Earth that's not only on the verge of starvation, but whose powers that be appear hell-bent on erasing humanity's proud past to prevent such delusions of grandeur as the pursuit of knowledge and excellence. This earth is a dry and dusty place, but rather than Nolan beating us over the head with global warm-mongering he chooses instead to find a solution by looking upward and forward, not by hunkering down and pretending the past didn't happen. It's a wonderful change from so much of Hollowood's social justice twaddle. I won't bore you by going over the storyline again (you can read my original review from 2015 here). Suffice it to say that this is a more serious science fiction movie than most of what's released in the genre these days, and one that does its best to keep the science front and centre with the fiction. It's a ripping yarn, but also one that packs an emotional punch as Cooper's family is first torn asunder, wanders in the wilderness (figuratively and literally) and then finally comes together again at a great way station in the sky that looks like it's been pulled right out of the writings of Arthur C. Clarke. One of the reasons to embrace the 4K version is that Nolan, as is becoming his habit, shot Interstellar on both IMAX and conventional film - and the 4K really showcases both to their best. The IMAX sequences really stand out, with a picture that pops right off the screen, though even the conventional footage is enhanced over the 1080p Blu-ray version (I used Oppo's flagship 4K universal player to A/B between 4K and 1080p for comparison). There isn't as much IMAX footage here as there is in Dunkirk, but it's very welcome: most of the IMAX is eye opening, whether it's the simulated dust bowls of earth (filmed in great part about an hour and a bit from where this is being written, in Calgary, Alberta) or the fantastic vistas of black holes and alien worlds. The "cinemascope" sections have a wider aspect ratio, but are smaller top to bottom (2.39:1 as opposed to IMAX's 1.78:1), and this imparts a more intimate feel to those scenes rather than the BIG SPECTACULAR feel you get from the IMAX parts. Both aspect ratios work, but as I said in my original review, "if I had my druthers I'd probably want to see the whole thing in IMAX, like James Cameron did with Avatar, but that's a minor quibble at best because the multiple ratios work quite well." As mentioned above, the 4K picture, which is enhanced by HDR, is nearly perfect, and if you want a disc with which you can make your friends and neighbours jealous, this is a good one (though that's hardly unique in the 4K world). The image is razor sharp, fine details and the textures (including falling dust) looking clear, clean and true to life. The "35 mm" scenes are also outstanding, but seem a tad softer than the stunning IMAX sections. That's really a quibble, however, because the image at both aspect ratios is definitely reference quality. Whites are very white, blacks (there's plenty of black in space!) are rich and inky and detailed, and the twain meet beautifully, with lovely differentiation between the shades that lets you see clearly stuff than on a lesser presentation might be just a big coloured mass. The weakest link is the film's overall look, its colour palette, which in places looks a tad washed out - kind of like Dunkirk's. Despite that, however, this is a gorgeous transfer and any angst I experienced over the colours is more than made up for by the brightness and fantastic detail. And it isn't as if the colour is so washed out it looks like black and white. No, indeed! If you want a good example of the differences between a great 1080p disc and a great 4K HDR one, this isn't a bad place to start. The lossless audio track is DTS-HD Master Audio 5.1 and while, as mentioned above, it's so loud I had to turn it down, the low frequency effects channel isn't as overpowering as The Dark Knight Rises' (though it's close). It's interesting to note the omission of a Dolby Atmos track, but since I and most people can't play that back natively yet it really isn't a big deal. And to be fair, the 5.1 mixing has no problem filling your listening room with great sound. I did find Hans Zimmer's musical score a tad obtrusive at times (not nearly as much as in Dunkirk, though), and the dialogue was hard to hear over the music occasionally - but that's the exception rather than the rule. There are no extras on the 4K disc, but there's a third disc in the package (besides the 4K and 1080p versions of the film) and they're very interesting and quite substantial. "The Science of Interstellar" and "Inside Interstellar" give fascinating insight into the story and the film, as well as Nolan and his team's attempts to be accurate scientifically. As with the extras with Dunkirk, this stuff is worth the price of admission, not only to learn about how they made Interstellar, but also to help understand the science behind this "serious" sci fi yarn. There are also a teaser and three theatrical trailers. As I mentioned in my original review, when I watched Interstellar I had visions of Kubrick's masterpiece 2001 going through my head, which is high praise indeed. Unlike 2001, however, Christopher Nolan's movie is more accessible and less "cerebral" (not that it's any slouch on its own). Both films deal with mysterious aliens who facilitate journeys into deep space through some kind of portal (and we come away from both films not knowing much more about them than we did initially), but Interstellar also adds the type of action and exposition that Kubrick's mostly visual extravaganza eschewed. Since 2001 is one of my desert island discs, and in some ways Interstellar is a more enjoyable film, I may have to take both of them to my desert island. I sure hope there's electricity there!